Auset Egyptian Oracle Cards give you the power to see and change your future. These 44 cards and guidebook offer access to the magical powers and sacred wisdom of Auset, Mother Goddess of Healing and Prophecy. 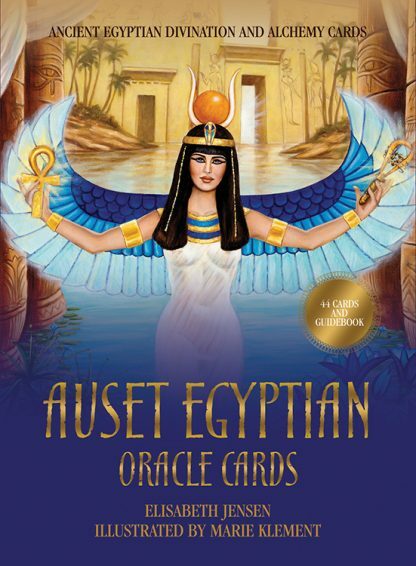 Also known as Isis, the most loved of all the Egyptian goddesses, Auset imbues these cards with her divine intuition, which makes them highly accurate, specific, and reliable for personal and professional readings. All the major gods and goddesses of ancient Egypt offer their wisdom and guidance through the beautiful artwork of renowned spiritual artist Marie Klement and the spiritually inspired writing of Elisabeth Jensen, international teacher of Auset Temple Healing and triple award-winning psychic. Elisabeth Jensen once trained as a community health midwife and registered nurse, working in an intensive care unit. This background gave Elisabeth greater insight as a medical intuitive, and she later received her diploma in hypnosis, Reiki, and NLP before opening her Auset Temple Healing school. Elisabeth is also the author of the popular Isis Lotus Oracle Cards. Marie Klement is a psychic artist, medium, clairvoyant, and numerologist based in South Australia. Her fine art paintings and drawings are featured regularly in national and international magazines, expos, and exhibitions. She has been specializing in drawing spirit portraits of passed loved ones since 1993.